Both these Homes are exclusively designed and built for Vacation Rentals meaning no one lives in these homes. they are built using the modern Energy efficient methods and are powered with solar panels. We also donate these homes to Non profits for fundraising events. This home was built in 2015! The 4 bedroom, 4.5 bathroom, 3360 square foot home, sits on 2 beautiful, private acres and boasts features, that could accommodate the needs of any group of family or friends. The main level offers a wheelchair access ramp, master bedroom and master bathroom with a zero-threshold shower, accessible height, toilet and sink. All other bedrooms feature en-suite bathrooms. ​The open floor plan makes gathering large groups easy and comfortable and the fully-equipped kitchen makes cooking for everyone that much easier. The lower level family room, has a foosball & air hockey table, plus Wii, and a Bose surround sound system. 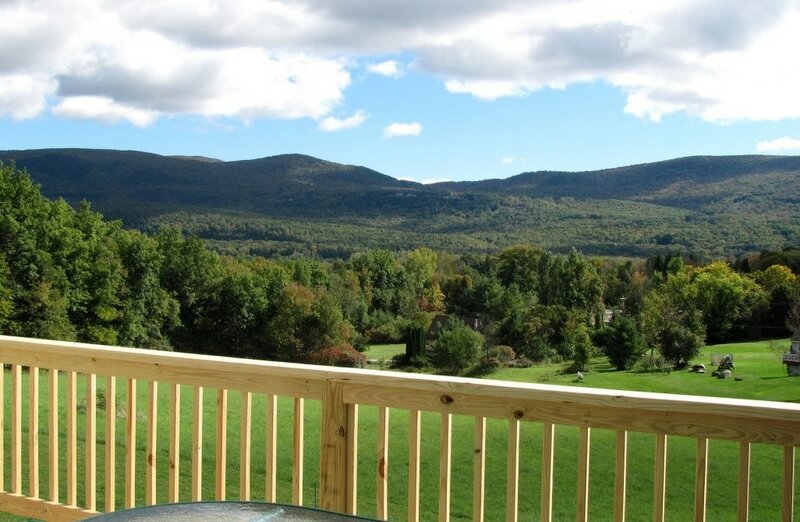 Enjoy the wrap around deck and take in the fantastic views. When it comes to the basics,we will have tried to think of everything! We supply All linens, towels, starter toilet paper, paper towels, and soaps shampoo & conditioner will be provided for your use! This 3360 square foot two level home is exclusively designed as a vacation rental home. Each bedroom has it’s own in suite bathroom. While the open floor plan allows for ample space for all to gather for meals and entertaining. ! Please note that the $50 each additional guest fee, only applies to stays of 6 days or less. The weekly and monthly rates are include up to 8 adult guests. Completed in December 2012, this beautiful home is 2600 square feet with 180 degree of fabulous views! Located, only 2 miles from downtown Manchester, nestled on 3.8 private, rolling acres offering 180° mountain views, the 3 bedroom 3.5 bathroom home is perfect for vacationing families or friends to enjoy plenty of time together without giving up the peace of secluded quarters. ​The house is accessible with an access ramp, and the Master Bedroom, has an accessible bathroom, with zero threshold tile shower and accessible height toilet and sink ! Each floor is a full suite with en-suite bathrooms and sitting areas while the large kitchen, living, and outdoor areas offer plenty of space for the whole group to eat, play, and enjoy. The lower level family room, features a foosball table and a sleeper sofa as well as a TV! 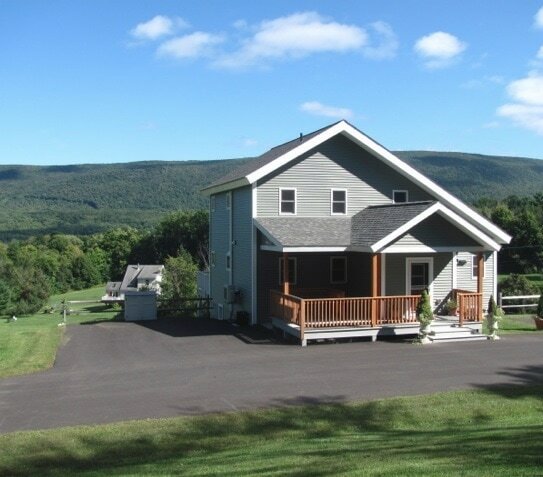 ​3 Bedrooms 3.5 Bathrooms On 3.8 Acres With Views!